The presentation of medals and t shirts will take place at our Presentation Evening later in September, the date of which will be announced soon. Details are out now for this years Bodmin Open you can find all the details on our events page. The 2013 Bodmin Open will include a “skins event” after Session 1, which will be open to the fastest 6 swimmers in the Girls 200 IM and the fastest 6 swimmers in the Boys 200 IM, with cash prizes; full details to follow. Great Event over the weekend with some great results for members of Bodmin Dragons, download below. Members of Bodmin Dragons entry squad, the Dragons, proudly show Club Speed Certificates gained at a recent time trial. Squad coach, Brian Roberts, said that he was delighted at the squad’s huge improvement since the last time trial. (g gold, s silver, b bronze in 50m Freestyle, Breaststroke and Backstroke). Several of the Squad were within tenths of a second of receiving awards and are looking forward to the next time trials. The aim of the squad, aged mainly 8, 9, and 10, is to prepare for competition by improving stroke technique, starting and turning skills. The squad usually swim relatively short distances of 25m and 50m with the emphasis on the quality of every swim. Great performances today at the Gloucester Sprints, the South West Regions yearly sprint event for Regional Qualifiers. There are 5 events, 50m in each stroke and a 100m IM, each competitor must swim all 5 events. Also great swims from Oliver Jarvis and Angus Jarvis. 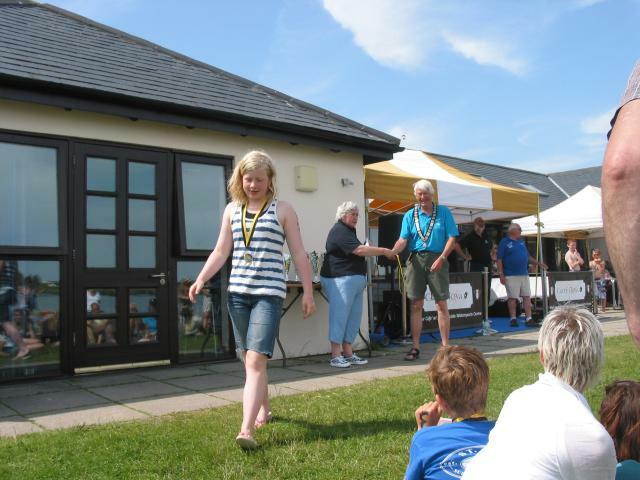 Juliet Wells collects her Age Group Gold medal at the first Cornwall County ASA Open Water Championships. CCASA's 2013/14 President Malcolm Hopes presented the trophies and medals assisted by Lynne Elliot the County's Open Water Coordinator. Thanks go to Staff at Stithians Reservoir for putting on a great event, all the volunteers who helped make it a fantastic day and Cassie Patten for finding time for the swimmers. Its that time of the year again the Annual General Meeting of the club. It will be at Dragons Leisure Centre, Bodmin, on Friday 17th May starting at 5pm and will go through until 6pm with half an hour of general discussion afterwards.